In 2011, Sarah was awarded first place in the International Dream Home Contest by transforming an outdated space into a luxurious and inviting living room in her client's home in Blue Bell, PA. In recognition of her achievement, Sarah was honored in New York City by Mario Buatta, one of the world's best known interior designers. Buatta, named by Town and Country magazine as one of the Top 12 designers in America, said "Sarah is very deserving of the award." Sarah was featured in Main Line Today for winning Decorator of the Year and beating out over 250 other participants from across the country. The judges included editors of more than 30 magazines such as Better Homes and Gardens, House Beautiful and Traditional Home. 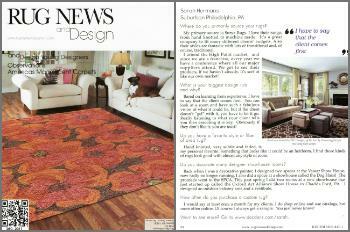 Rug News and Design magazine, which covers design trends across the globe, featured Sarah in their December 2011 issue. They interviewed Sarah and shared her expertise about selecting and purchasing the perfect rug. She firmly believes that "the client comes first." Main Line Today's article "Beautifying on a Budget" highlighted tips and tricks from Sarah. How much does it really cost to decorate? In this article Realtor Magazine article, Sarah explains how, for her balcony design, it was better to "splurge on seating and cut back on curtains and pillows." Read more here. Sarah Hermans has been selected by the Houzz community as a winner of the Best of Houzz multiple since she became a member in 2014. Design award winners’ work was the most popular among the more than 16 million monthly users on Houzz, and more than 230 million professional images. .